"Creamy chicken casserole based on the French classic, but without the carbs. This will be one of your favorite recipes. Low-carb and ketogenic diet-friendly." Place chicken breasts into a large pot and cover with water; bring to a boil. Cook until chicken is no longer pink in the center and the juices run clear, about 10 minutes. An instant-read thermometer inserted into the center of a breast should read at least 165 degrees F (74 degrees C). Remove chicken from the water. Place a steamer insert into a saucepan and fill with water to just below the bottom of the steamer. Bring water to a boil. Add broccoli, cover, and steam until tender, 3 to 6 minutes. Chop broccoli. Melt butter in a deep saucepan over low heat. Add onion and garlic; cook and stir until onion is clear and tender, 8 to 12 minutes. Add garlic salt, parsley, salt, and pepper. Pulse cauliflower in a blender or food processor until it resembles rice. Add cauliflower and chicken broth to the onion mixture; cook and stir until broth is nicely absorbed, about 10 minutes. Add heavy cream and lemon juice. Let simmer, uncovered, stirring occasionally, until well combined, about 10 minutes. Stir in mayonnaise and remove from heat. Let sauce cool until thickened. Pull chicken apart with 2 forks into bite-size pieces. Add 1/2 the pulled chicken to the sauce. Line the bottom of a casserole dish with the rest of the pulled chicken. Lay steamed broccoli on top; pour the cauliflower sauce over the broccoli. Top with Cheddar cheese. Cover with aluminum foil. Bake in the preheated oven for 30 minutes. Remove foil and bake until cheese at the edges is slightly browned, about 10 minutes more. Let casserole cool for 5 to 10 minutes; slice into 6 even portions. 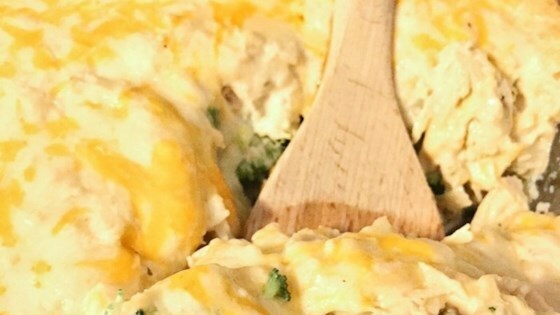 See how to make a creamy baked chicken and broccoli casserole. You can use frozen cauliflower if desired. Edam and Colby cheese would also work in this recipe. Very good. If you like this try the one with Cream of Chicken soup, Mayo, and Curry. It's a soup can recipe and is good. This was very good. I added twice the minced garlic and 2 cups of sliced mushrooms. The most delicious casserole, you cant even taste the veggies! Great for kids!